As I mentioned in my beer mac & cheese post, last weekend I was fighting some doldrums and decided to fight them with comfort food. Specifically beer comfort food. 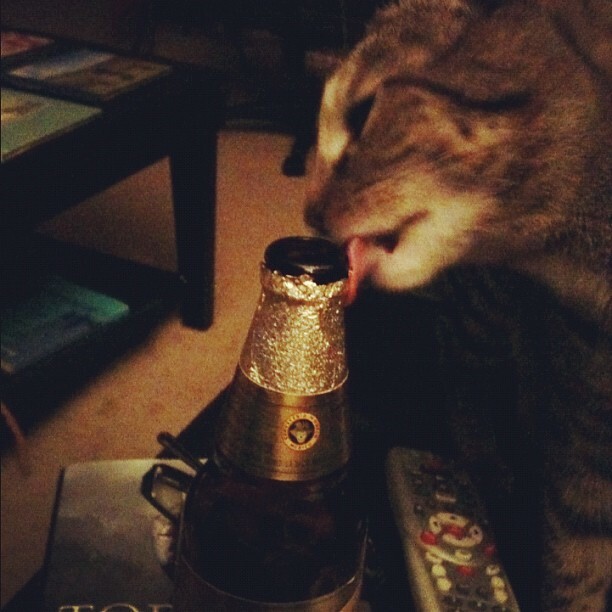 Because last weekend was a beer two-fer. The recipe is from one of my favorite food blogs, In Erika’s Kitchen, she always has great, unique, and simple recipes that use produce, whole grains, and less processed foods for awesome results. This was a very easy recipe, less than an hour from start to finish. 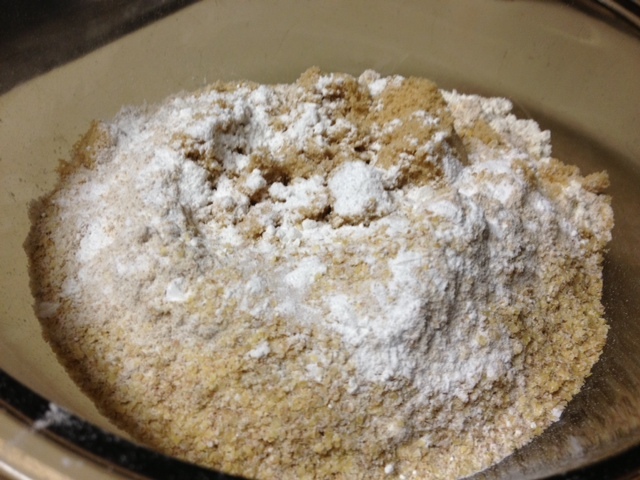 Preheat the oven to 375 F. Combine all the dry ingredients in a bowl (flours, brown sugar, salt, wheat germ, baking powder). Whisk the dry ingredients together, making sure they all get really combined (or you could sift it, I’m just too lazy). See how that beer is lurking creepily, waiting to meet its fate? Pour the whole 12-ounce beer into the bowl. 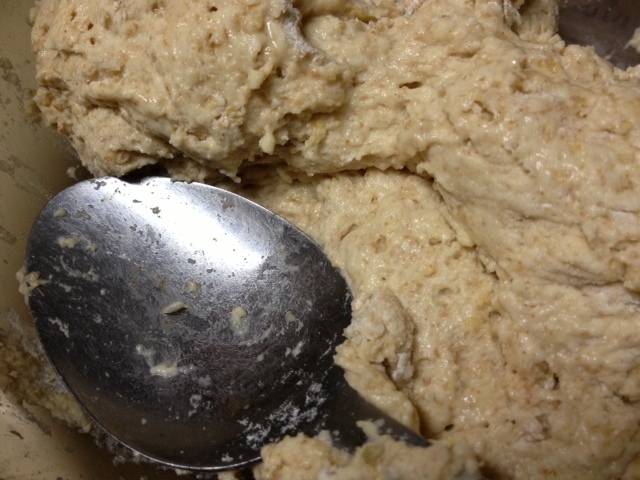 Using a large spoon (the whisk did NOT work well for this), combine with the dry ingredients. Try not to over-stir, but do make sure everything is combined. 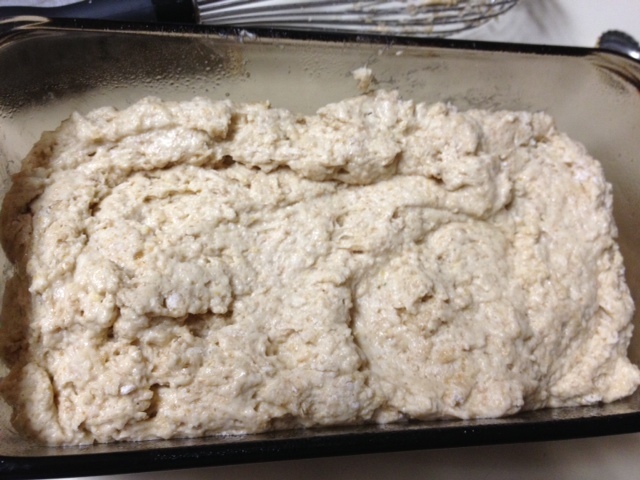 This is what my dough looked like—it was not runny like a batter, was definitely a wet dough. Spray a bread pan with non-stick cooking spray and transfer the dough to the pan, distributing it evenly. Now this gets a little decadent, because in addition to beer we also have melted butter. 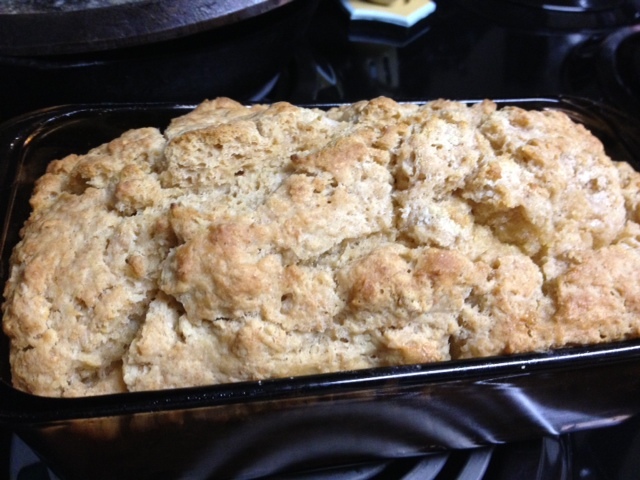 I didn’t claim this was the healthiest bread ever (though it’s really not bad). Pour the melted butter over the top of the dough. Bake for about 45 minutes, or until the top is golden and your toothpick comes out clean (mine took a few minutes extra, and was still a little doughy—how I like it). The bread had a great, unique flavor by itself, though I also tried it with apple butter, regular butter, and jam. I liked it both toasted and all by its lonesome. Strangely, I think my favorite piece was plain, un-toasted, without any butter or jam (which is definitely weird for me). This got devoured at work the next day, so I don’t really know how good it is as leftovers. All-in-all, a great recipe and I most certainly will make it again. 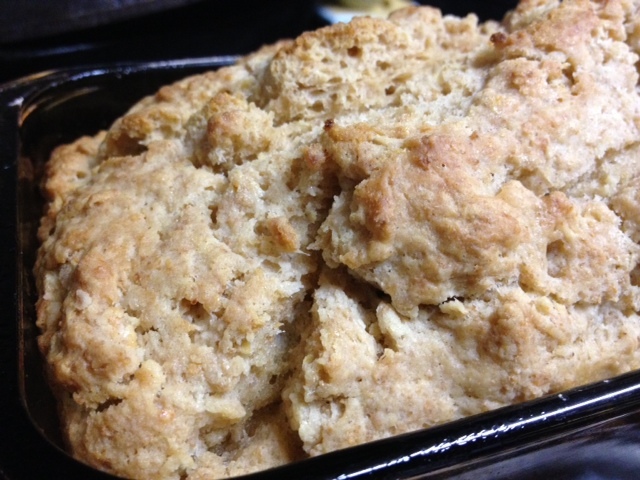 Preheat the oven to 375 degrees and spray a large loaf pan with non-stick cooking spray. 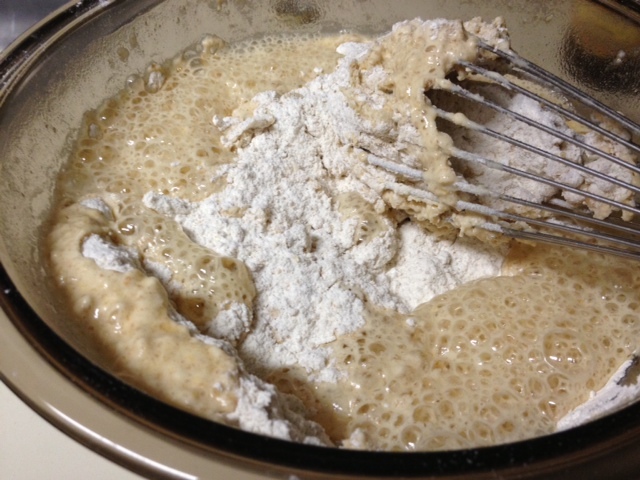 In a large bowl, whisk together the dry ingredients (flours, wheat germ, sugar, salt and baking powder). 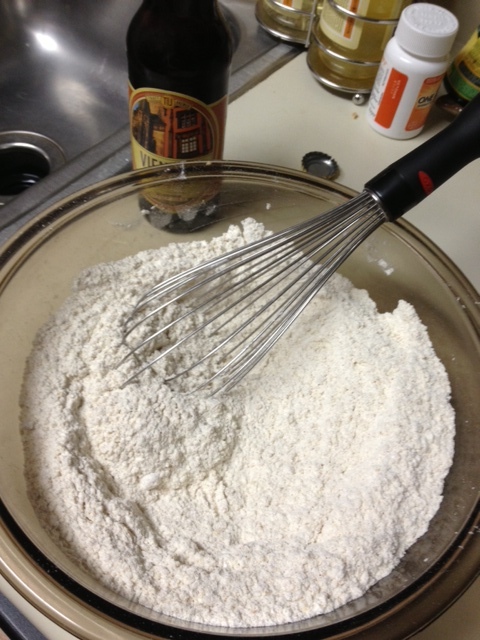 Add the beer and mix well (I used a large spoon for this, the whisk didn’t work too well). 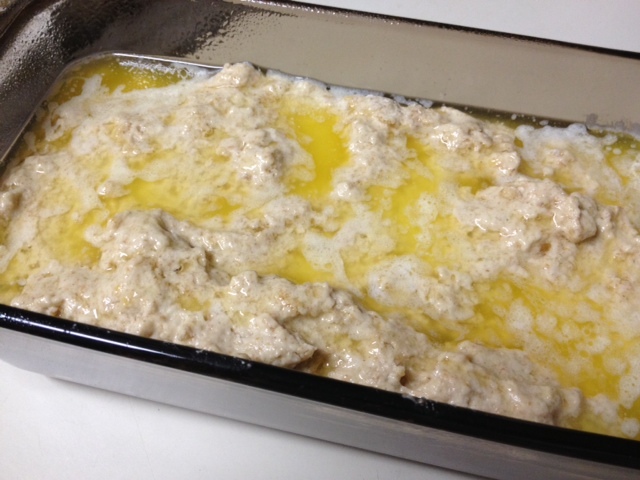 Pour the batter into the greased pan and pour the melted butter all over the top. Bake for 45 minutes or until the top is golden and a toothpick comes out clean (mine was more like 50 minutes).